Hurricane Irma was a historic storm, impacting all 67 counties in Florida. Local, state, and federal authorities have commenced the rebuilding operations in the aftermath of Hurricane Irma. I applaud the work authorities across all levels have put into the preparation strategies for this storm. Our state has once again shown its resilience in the face of natural disasters. If you need disaster assistance in the wake of Hurricane Irma and haven’t yet completed FEMA’s application process, I encourage you to do so soon. The deadline is November 9th. You can apply online at www.disasterassistance.gov or through a smartphone or tablet at www.fema.gov/apply-assistance, or by phone at 800-621-3362. If you are deaf, hard of hearing, or have a speech disability and use a TTY, call 800-462-7585. Additionally, FEMA is hiring local residents to assist in the disaster recovery effort in the aftermath of Hurricane Irma. Residents of Florida who wish to apply should email their resumes to FEMA-Workforce-FL@fema.dhs.gov. Please include the word “Florida” and the name of the job they wish to be considered for in the subject line. 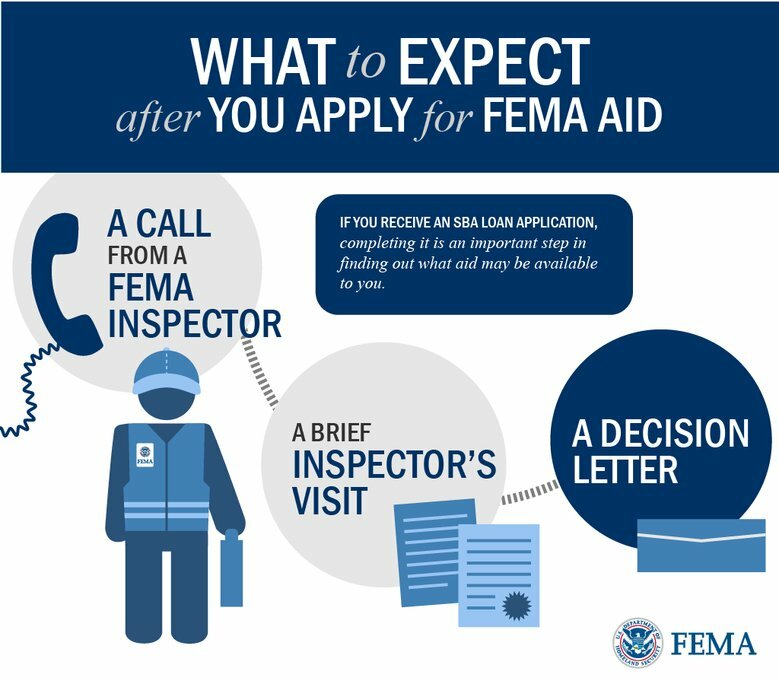 For more information on applying for relief, apply for a job with FEMA and tips to avoid fraudulent “inspectors” please visit my website at: https://webster.house.gov/hurricane-irma-information. A FEMA contracted inspector will contact you within 30 days to schedule an inspection. Inspectors cannot assess damage until your home is accessible. If your property was inaccessible at the time of application, be sure to update its status by calling the FEMA Helpline at 1-800-621-3362 when access is possible. When a FEMA contracted inspector comes to your property to assess damage, ask the inspector for ID. All FEMA contracted inspectors carry ID, and this will help you avoid fraudulent “inspectors” that prey on disaster-stricken people. A preferred contact method is requested; applicants may be contacted via email, phone, or mail regarding the interview, hiring and selection process. Residents who sustained losses can begin applying for assistance by registering online at www.DisasterAssistance.gov. Residents are also encouraged to download the FEMA App to begin the registration process. Click on Disaster Resources. If you do not have access to the internet, you may register by calling 1-800-621-3362 or 1-800-621-FEMA. Governor Rick Scott has re-started the Florida Small Business Bridge Loan Program to assist the small businesses across our state that have been affected by the storm. The program is intended to provide short-term, interest-free loans to small businesses that have sustained physical or economic damage. The application period runs from September 14th, 2017 to October 31st, 2017. To complete the application or get more information on this program, visit www.floridadisasterloan.org. You can also reach the Florida Small Business Development Center Network – which runs the loan program – at 850-898-3489 or e-mail Disaster@FloridaSBDC.org. Phones will be answered during the regular 9am-5pm hours Monday-Friday. Voicemails and e-mails will be responded to within 24 hours. Dislocated Worker Grants have been awarded to provide temporary employment assistance to Floridians affected by Hurricane Irma. The Disaster Unemployment Assitance (DUA) program provides assistences to Floridians whose employment or self-employment was lost or interrupted due to Hurricane Irma. To apply, visit www.FloridaJobs.org or call the hotline at 1-800-385-3920. For real-time traffic information and updated evacuation route in formation, visit www.FL511.com. The Florida Department of Transportation crews are working with utilitity crews across the state to clear roads so power can be restored. Every interstate and turnpike is open for Floridians, but please heed local officials directives on when to return home. Almost 600 shelters are open throughout our state, housing almost 250,000 individuals. Among those, more than 90 are special needs shelters. More information for shelters in your area can be found on www.floridadisaster.org/shelters. The American Red Cross Safe and Well website is a free public reunification tool that allows individuals and organizations to register and post messages to indicate that they are safe, or to search for loved ones. Registrations can also be completed by texting SAFE to 78876. Messages exist in both Spanish and English. To speak with someone at the American Red Cross concerning a missing friend or relative, please contact 1-800 RED CROSS (1-800-733-2767). If you have a National Flood Insurance Program (NFIP) flood policy, you may be eligible for reimbursement of actions taken to protect your property. Call your insurance agent to find out more. To file a flood insurance claim under the NFIP, contact your insurance agent immediately. You can also call 1-800-621-FEMA (3362) – select option 2 – to learn more about your policy, and be directed to the appropriate claims resource. FEMA, through its National and Regional Response Coordination Centers and liaisons to the National Hurricane Center, is actively monitoring the track of Tropical Storm Irma and continues to support local authorities as they respond to the damage it has already caused in Florida, Georgia, the U.S. Virgin Islands and Puerto Rico.